Most of the time when I see information about Sikhs and Sikh identity, I see the image of a Sikh Man with a turban shown. Lately I have been thinking about Sikh women and some of the different challenges that are faced by each of the Sikh genders. Most Sikh women these days don’t wear turbans or any obvious sign of being a Sikh, so for them it is easier to just blend into society. The only sign might be a Kara on their wrist. Should there be more? For me having a turban and a distinct outward appearance is a large part of what keeps me on this path. I think of our turban/bana as a Nishaan Sahib that states to the world "I am a Sikh", or at least states that I am someone who is committed to a unique lifestyle. As Sikhs we are meant to stand out and be noticed, which is why the Guru gave us this distinct appearance. After Guru Teg Bahadhur was martyred many of the Sikhs hid away in fear and said they were Hindus. It was after this that Guru Gobind Singh ji gave us a distinct bana & a unique identity on Vaisakhi 1699. This identity (turban/long hair/kara/bana/etc) is a sort of uniform that uniquely identifies us. When you see a nun wearing a habit you know who she is. A police officer, a doctor, a fireman and a soldier all have their uniforms which make them easily recognized. As a Sikh, I feel that keeping my identity is a tool which helps keep me on my path. You won’t see a nun in her habit drinking and dancing in a night club or doing things that would represent her religion or church in a bad way. 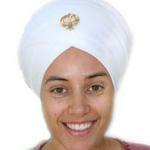 In the same way, keeping the outward form of my Sikhi can help keep me from doing things that are not good for me. I often hear Sikhs talk about the Sikh youth and how they are losing their identity as Sikhs. Many Sikhs have lost touch with the direct experience that gives one a reason for living this lifestyle Then the outward form loses its meaning (or at least does not hold sufficient meaning to keep it). For many, living as a Sikh has become a ritual, or a black and white list of rules and regulations (should do’s and can’t do’s) that one must to follow, rather then a practical and powerful lifestyl ethat inspires and expands peoples lives. I think these days most Sikhs are "cultural Sikhs" who were born into a Sikh family but don’t have much of a real day-to-day practice of Sikhi. This is similar to how people are in mainstream America who might be Christian or Jewish. They are born into that religion but for most it doesn’t actually mean much, except an occasional visit to Church or celebrating a religious holiday. This is just the natural course that has taken place as people have slowly lost touch with the technology and experience of their religion. The children that are being raised today have not gotten the exposure to, and experience of, living this lifestyle so they don’t know the value of it. This isn’t a guilt trip, but just an observation that a big part of the reason Sikhs are no longer keeping this roop is that people are loosing touch with it and not having the experience that it gives one when done consciously. The children only know and experience what they are exposed to by their parents and people around them. Back to the topic of women. Sikh women have an added challenge. Since most Sikh women don’t wear a turban/crown, it is a lot easier to get sucked into the norm of society. Modern Sikh women most often look just like everyone else (long hair down, makeup, western dresses, etc). So their experience and journey as a youth of finding their identity as a Sikh is often very different because they don’t have a strong outward appearance like Sikh men who wear a turban and stand out. I have found that the very act of wearing a turban and looking different forces you to think more consciously about your identity as a Sikh. By not having this "challenge" as a youth I think you loose a big opportunity that can enable you to better understand and experience living as a Sikh and the reasons for doing so. When I started the SikhMatrimonials.com website many years ago I used to get a lot of complaints from people about matrimonial listings that pretty much just wanted to meet "cut haired Sikh" men. A large number of the listings were just "Cultural Sikhs" or probably more accurately "Punjabis" who didn’t really want someone who was a Sikh with a turban. For this reason I changed the way the SikhMatrimonials.com website was oriented so the profiles and information were highlighting and promoting Sikhs who choose to keep their identity (even though this is the minority these days). So where does that leave us today? I still often think about the role and identity of Sikh women. I feel that we as Sikhs (both men and women) have melted into the cultural melting pot and lost our precious and unique identity in the process. The issue is not so much about men and women wearing or not wearing a turban, but about being proud of our Sikh identity and more than that, wanting to have the living experience of it! If we don’t teach our children then who will do so? If our own glass is empty then we have little to give to our children. So of course the first step is for each of us as parents to live it ourselves; To re-discover and experience our Sikhi so that we can better share it with our children. Kids are extremely sensitive. Their antennas are tuned to all the parental frequencies and they are receiving the signals. We cannot live as hypocrites ourselves and expect our children to respect us and trust us. Shipping our kids off to a one week Sikh camp isn’t enough. It has to be real. All these practices and beliefs are useless if weyou don’t live it, practice it and experience it for ourselves. As Sikhs we are learners and should always be looking to learn and expand ourselves. We should not be caught in the black and white box that so often is the norm in Sikh society which too often only divides people into different boxes (caste, education, skin color, religious or non-religious) rather then seeing the One Divine God within each and every person. I feel that many of us have lost touch with the basics of just being a good human being (forget about even being a Sikh). I don’t consider myself a Sikh intellectual or an expert of any sort. In fact I really can’t relate to Sikhi in the intellectual way that seems to be so common these days. I look at the path that Guru Nanak laid for us, and I practice it in a simplistic way. Being kind and compassionate to everyone no matter what. Seeing the other person as God and as a mirror of myself. Helping, serving those in need. Spending time each day to connect with my soul and clean my mind. For me all the Sikh intellectualism just distracts from the practice and too often turns into mental debates about who is right or wrong. Very often I read something in the forums or in the news about things Sikh related, and all I see is people arguing, fighting, judging and dividing themselves. To me this is not the Sikh way and I want no part of it. Each moment we have a choice in how we want to direct and use our energies. We have a choice of what we think about and what we say. Do we choose positive change and personal growth or do just ride the worldy emotional rollercoasters that don’t benefit us, and in fact, bring us pain and sadness? We attend to distractions that constantly keep us from fulfilling our real purpose here on this earth. I don’t really have any particular conclusion or "answer" in regard to Sikh women’s identity. I personally think that Sikh women wearing turbans are so beautiful and radiant and that every women has that privilege just as a man. A turban is not a "Guy" thing. Turbans can be very feminine and beautiful (My wife and many in my community wear all styles of women’s turbans). I think it is up to each of us to discover ourselves as Sikhs of the Guru and find our own way, whatever that may be. Each relationship between the Guru and His Sikh is unique, The trick is to learn and experience this lifestyle that the Gurus gave us; to make it real through daily practice. The life of a Sikh and of self-discipline is not the easy path. It takes effort. The priceless diamond is formed by thousands of years of pressure on plain old carbon – the most common element on the planet. So to become the jewel of the Guru it does have it’s challenges. That is what sets a Sikh apart from just anyone. The challenge, and rising to it, is what makes us strong and makes us shine! What an amazing gift our Guru has given us! You say that you are not a scholar of sikhi, but this article represents the very fabric of higher thought that the Guru teaches us. Well done! May I add a message to all my bretherin out there; be proud of who you are, rather than desperately trying to be something your not, just to fit in. The sikh roop is beautiful and I mean that in the literal sense as well as the spiritual sense. Just because our appearance does not conform to an everchanging fashion concsious society does not make it less beautiful. Again, brilliant article, thanks for sharing. The Rehit was written in a time when all Indian women wore dupatta (chuni). Sadly many interpret the option for a Sikh woman to chose whether or not to wear a turban as a license to go bareheaded, when every Sikh is meant to keep their hair covered. No one can ever expect to experience the Guru’s blessing when they choose not to accept it to begin with. If one does not confront the ego how can they expect to ever subdue or over come it. We just have to keep playing up examples of very chardi kalaa sisters who have realized the benefits of standing out as khalsa and hope to reach and inspire those who choose to remain downtrodden enslaved to societies dictates rather than embrace liberation offered by Guru’s roop. Greetings Harjit Singh, wonderful to know what you are doing. I had the same thing kept my hair since 1998 and never looked back. Please do remember besides the identity every Sikh is asked to read the SGGS and understand it and implement it in our daily lives. Raising the issue of identity of Sikh-women in such fine words is really up to the mark. Here we judge them in day to day routine by names; sometimes kaur is not affixed but from recognition from the appearance or the first sight can only be with turban. I see the girls dropping even kaurs from their names. We really need to start a movement so that the distinctive identity given by our Tenth Master Sri Guru Gobind Singh is established for Sikh women. Even our religion has projected them as equal to men. A fascinating and inspiring insight. It really motivates one to look inside oneself and get closer Waheguru so that we may merge with him. Well done for writing such an eloquent piece. I have so much respect and love for Sikhism even though I am not a sikh. What I have learned about what it means to live the Sikhism way of life rings more true to me than any other religion I have been introduced to. One thing I know for certain is there is no point in being a sikh if your commitment is true, you are just cheating yourself. Be proud of being a Sikh it’s beautiful, honest, and fullfilling way to live your life! excellent !!! and Thanks for sharing this article..
We need this kind of thinking in sikhism. May Waheguru bless us all with such belief. Its true that following sikhism is a way of consiousness….or its nothing. Thanks Gurumustuk Singh Ji and everybody else. Your comments brought tears in my eyes. I am one of those Abhaga, who have cut their hair. Gurumustuk Ji you are doing a wonderfull service. It was only after looking at your website and listening to the kirtan from your website, I started to go back to where I should be. It is almost one year since my love for Gurbani has deepened. I have started doing my morning prayer and meditation also for the last 2-3 months. Howvever I still dont see myself going back into the real Sikh Roop. I dont know where to start. I am a Software Engineer working in Germany. All my friends, customers etc., knows me only in my current roop. I do Ardaas to Waheguru to show me the path. You all seem to be Guru Ke Piyare. Please do an Ardaas for me to Waheguru to show me the path, the path to be a True Sikh. May Waheguru bless us all with such belief. Be proud of being a Sikh itâ€™s beautiful, honest, and fullfilling way to live your life..!!!!!! Gurmustak, your write up is good and your feelings genuine. But as a societal entity what is happening to Indian Sikh society is a natural and inevitable path of community growth. People in the west, like you, the new converts to Sikhi do feel this is wrong and should not happen. But if my cold logic serves me right, the same thing will happen with you down the generations. All the sentiments expressed in the comments are noble and honest. But when people are born into a religion it is a choiceless ascription, and not everyone wants to stick to that. From a sociological perspective what has happened to the generations of sikhs in India shall happen to the generations of Sikhs in West. You made your choices and your children shall make theirs, simple. Rehat Pyari Guru Ko, sikh pyara neh. I love sikh way of life(kirt karo, naam japo, wand chako aur tyar bar tyar to defend truth), i dont care for "sikhs" that dont have sikh way of life. Bina Shastr Kesan Narn Bhed Janu. Without sword(Gurmat/kirpan-MIri/Piri) n hair, A person is naked sheep, ready for butcher. "Sikhs" with no hair/sword=sheep. Guru gave uniform and amrit, focus=Saint Soldier. Only Bana, NO Saint qualities(truthful living) makes Frauds. Most sikhs are Fraud and dont know it. Soon/later all (except ones who surrender all logic to Guru' s wisdom) fall to hands of pandits, intellects,idols,pictures,priests,yogis,sanyasis,moolahs,jathedaars.. all same pandits different attires. They aint connecting with the 1, just fraud. Shops aint going anywhere,Sikh stays away from them. Gursikh trades of truth 24/7.No logic/ contention.One with Guru. Gurfateh ji. Surinder Singh Sokhi. 112883024510657903 - Arjan and Kelly on top of the car. Kelly just got a new car so she wanted to get a picture on it with the Aspen trees.